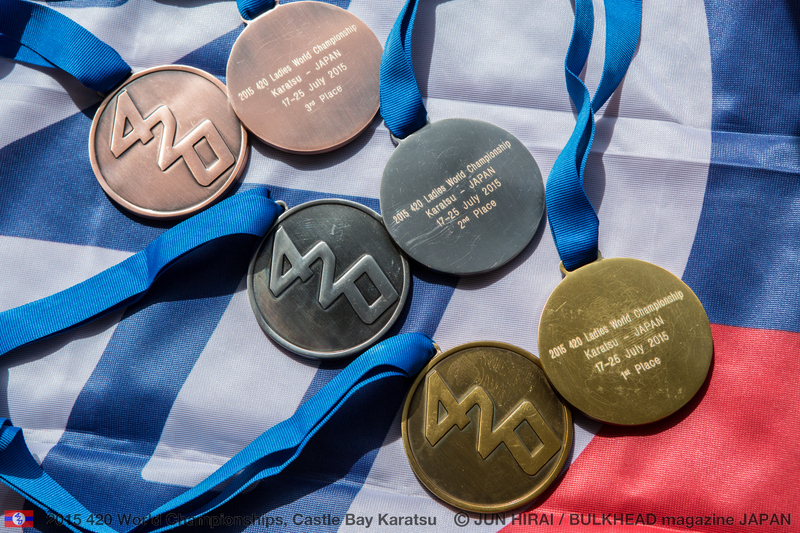 The home nation’s sailors were the stars of the show, sealing a gold and bronze medal, as well as top overall nation. 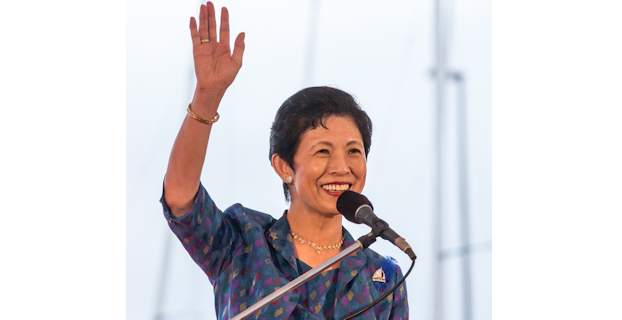 Yumiko Shige, 420 Worlds Event Manager, has been instrumental in the growth and popularity of the 420 Class in Japan, as well as being a national heroine. 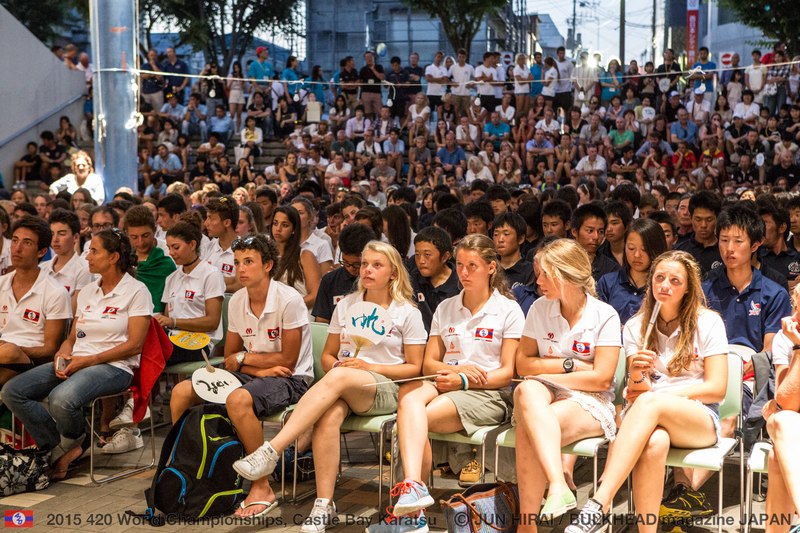 Shige achieved Japan’s first ever Olympic medal in sailing at the 1996 Olympics, a silver in the 470 Class, and shared her views on Japan’s success, “Competing at a home venue means our sailors could stay relaxed and familiar surroundings, so they could keep their usual style and environment, which helps. 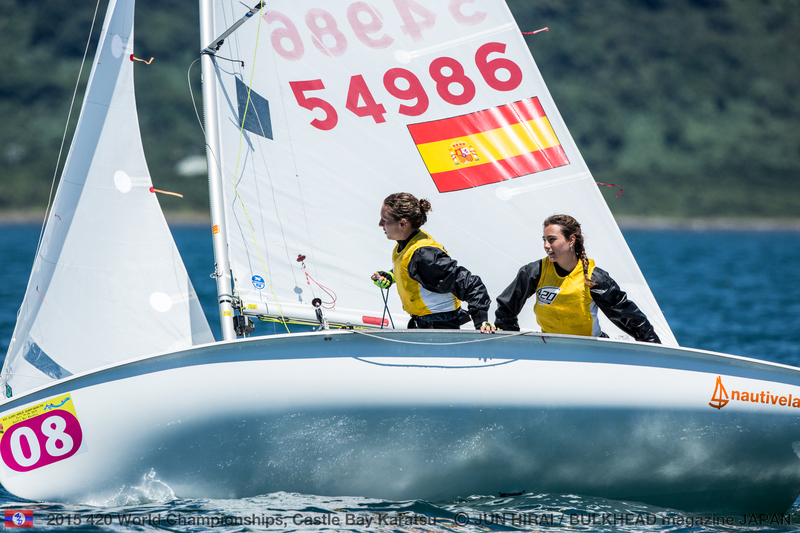 Marta Garrido/Maria Jesus Davila (ESP) held firm in first overall, and sealed World Championship victory with a race to spare, as their 11th place finish in race 11 sealed the deal. 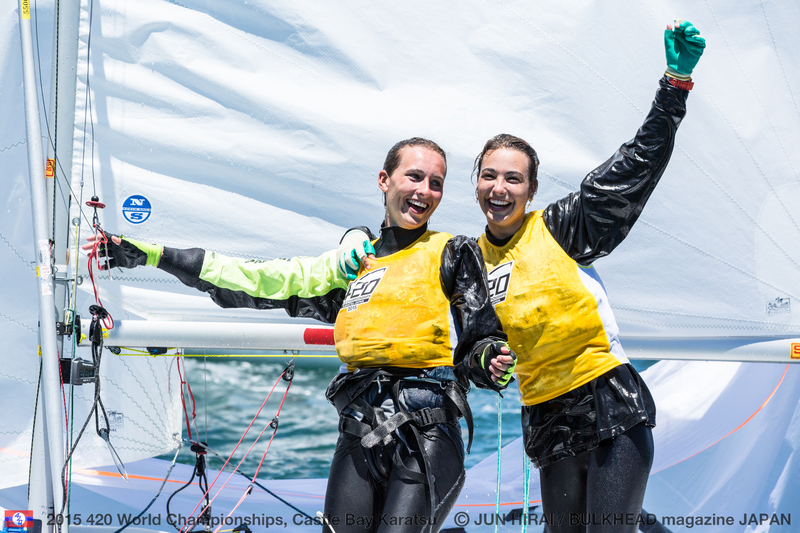 France's Charlotte Yven/Marine Riou (FRA) managed to upgrade their overnight leader board position of third to a silver medal with a 26, 2 scoreline. Japan’s Misaki Tanaka/Sena Takano claimed the bronze medal. Garrido explained their teamwork dynamic, saying, “At the beginning when we started training, we didn’t understand each other very well, so we worked hard together. When we arrived here in Japan, we felt very comfortable in the boat and I think Maria understands me very well and knows my style of sailing. I think I understand Maria too. “The level in this Championship was so high and so difficult. Each race was completely different from the other races and we needed to be so concentrated and focused in each race, as the other competitors sailed so well. 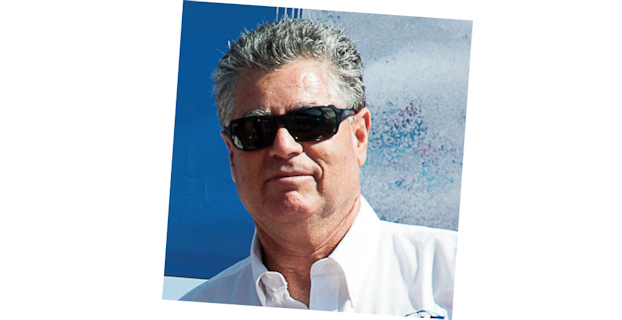 Davila continued, “After race 11, we just took some big breaths to stay calm, and we no longer felt nervous. For the last race, we just wanted to enjoy it and have fun. 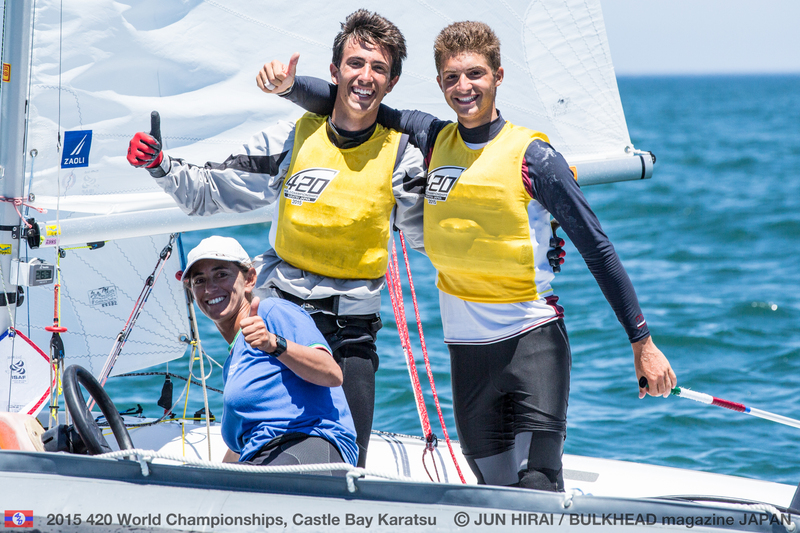 With the Spanish untouchable, the battle intensified for silver and bronze. 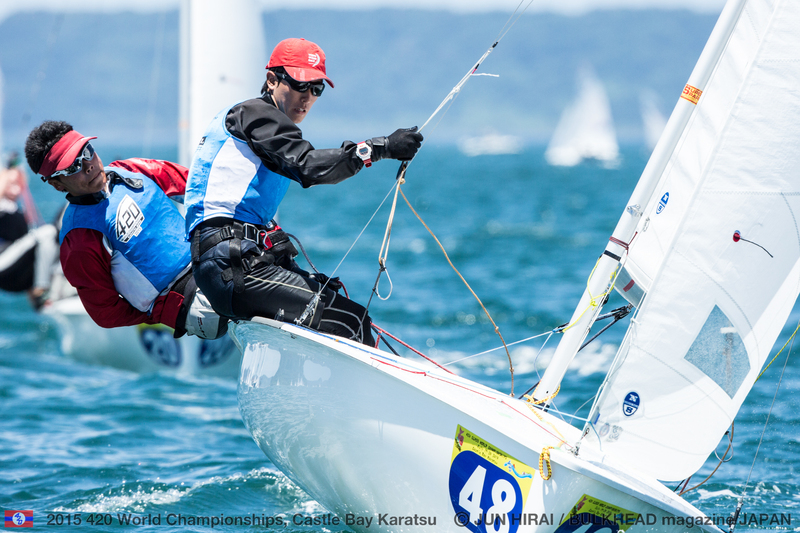 Two double-digit finishes dropped Misaki Tanaka/Sena Takano (JPN) from 2nd to 3rd overall, with France’s Charlotte Yven/Marine Riou managing to pull back from a 26 in race 11, to a 2nd place in race 12 and seal silver by 1.2 points. 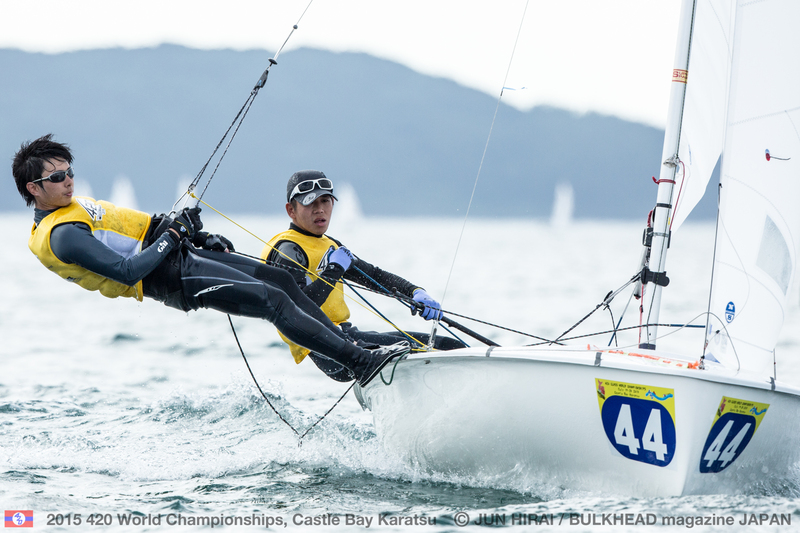 “This is like an acknowledgement that all our hard training has paid off,” added Nakano. 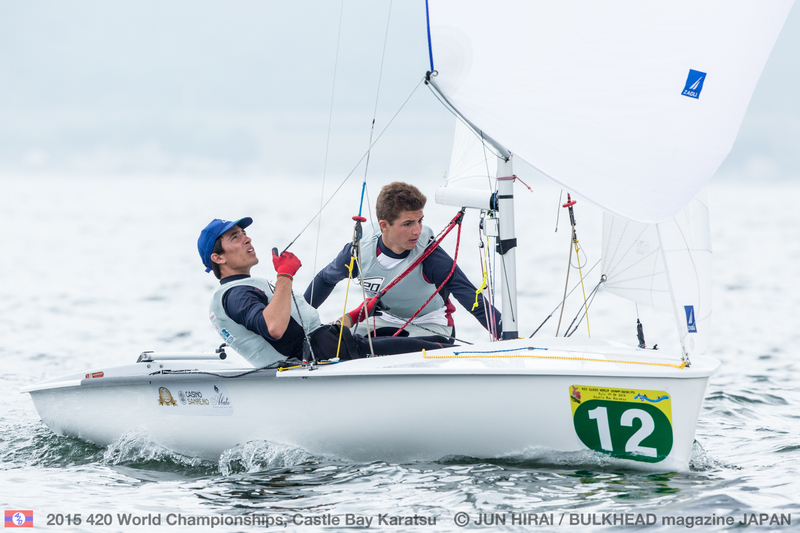 The pair have been sailing together for two years having both stepped up from the Optimist. 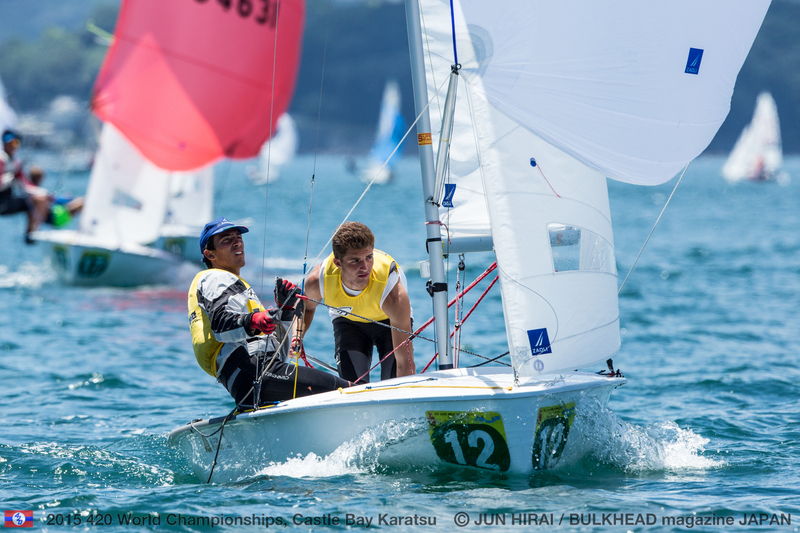 Takayama’s path included seven years of Optimist sailing, counting two appearances at Optimist Worlds, and the chance to represent Japan in the Laser Radial at the 2013 ISAF Youth Worlds. “It helped,” said Wiley, referencing the race 11 win. “We were just going for top five the whole day, just consistency to finish it off . The win was a nice gift. 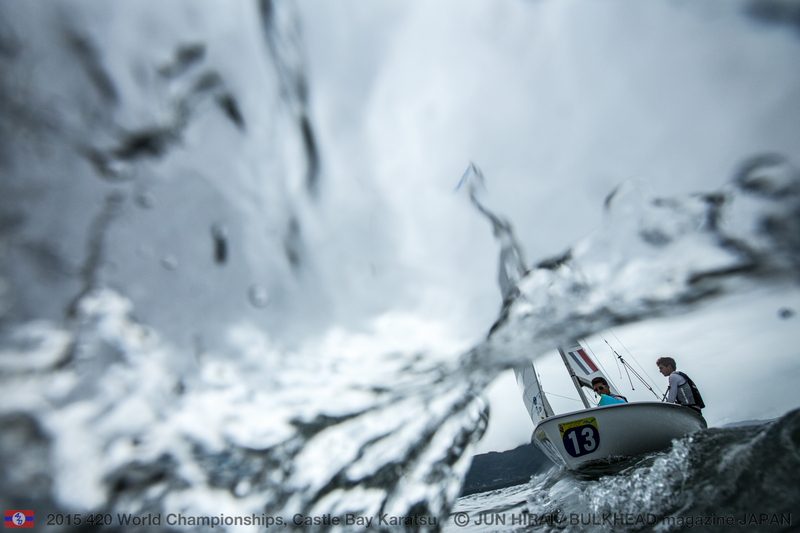 “We tried to go out there, have fun, sail fast and worry about the results later. This is just an amazing feeling. We have really been working hard the whole year and to come out with a silver at the Worlds is truly an honour. It feels good that all the hard work has paid off. 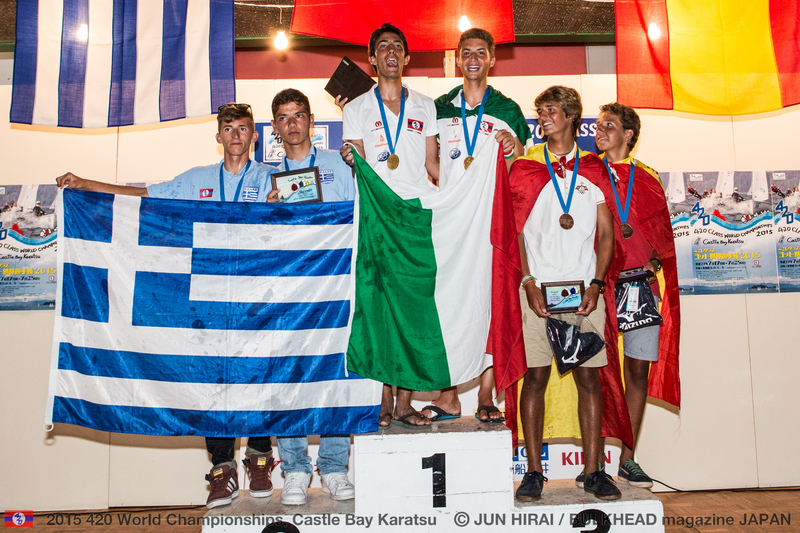 This is definitely going to boost our confidence levels for the Junior Europeans. John Merricks Trophies – presented to the highest placed team, both aged 18 or under, at the end of the year, was presented to Misaki Tanaka/Sena Takano (JPN) in the 420 Ladies and Daichi Takayama/ Syota Nakano (JPN) in the 420 Open. 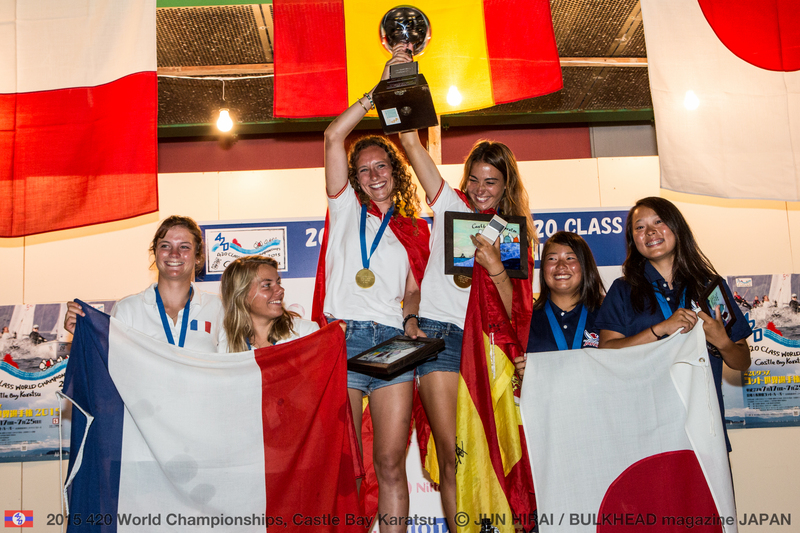 Francis Mouvet Trophy – was awarded to Japan, as the nation with the highest placed three teams in the World Championships, across both the Open and Ladies fleets. 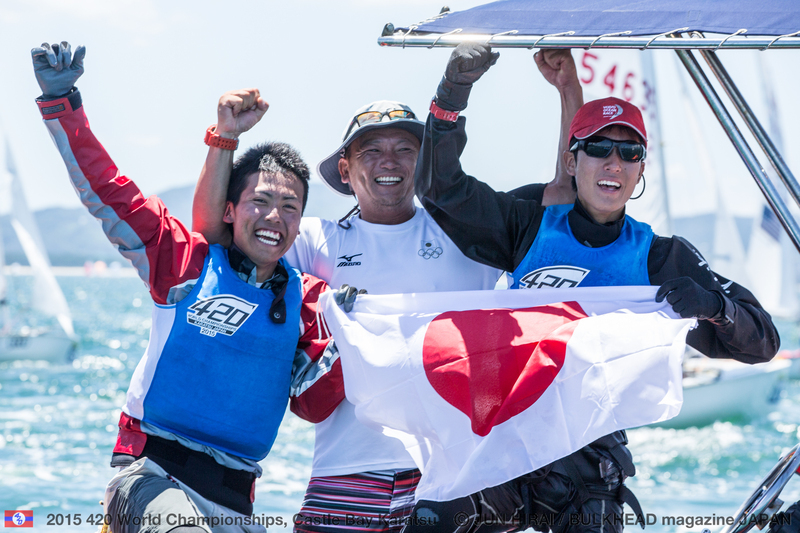 The 2015 420 World, Ladies World and U17 World Championships, 17-25 July 2015, was held in Castle Bay Karatsu and organized by the Japan Sailing Federation, in partnership with: the International 420 Class Association, Japan 420 Class Association and Saga Prefecture Yachting Federation. 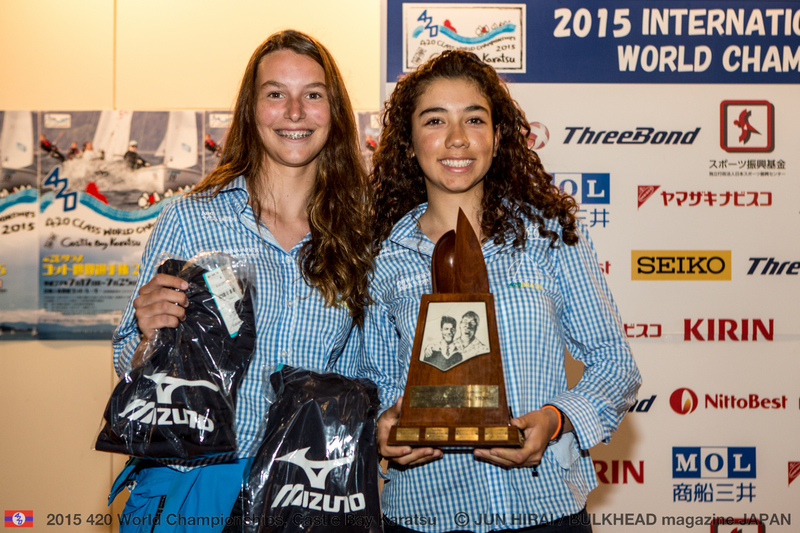 330 sailors from 21 nations competed, with 72 boats in the 420 Open and 60 in the 420 Ladies and 33 in the U17. 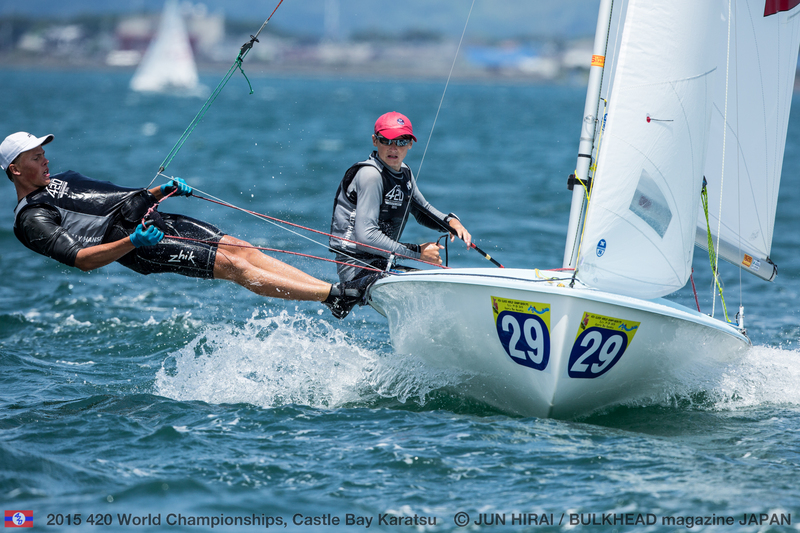 The 420 Open and 420 Ladies teams contested a 12 race series, with 6 races in the qualification series and 6 in the final, with a single race discard coming into play after race five. The 420 Open and 420 Ladies were each split into fleets for the qualification series with reseeding after each day’s racing. 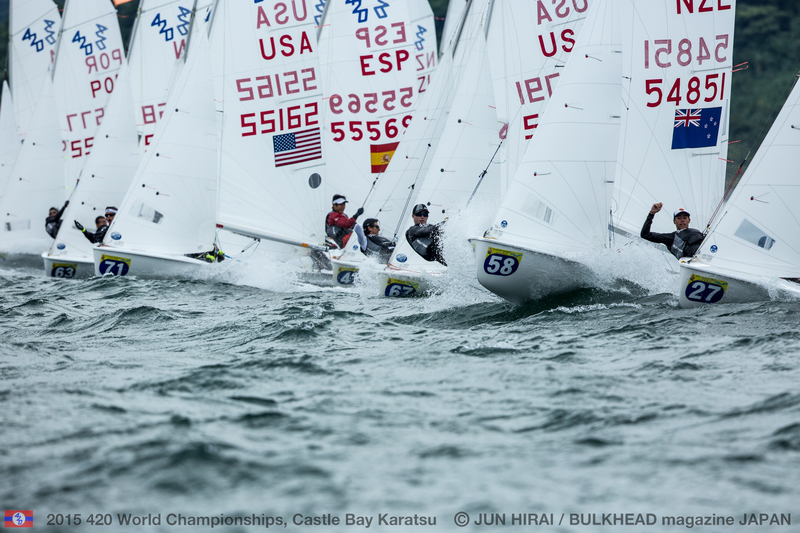 For the 6 race final series, teams advanced to gold and silver fleets, based on their position on the leader board from the qualification series. 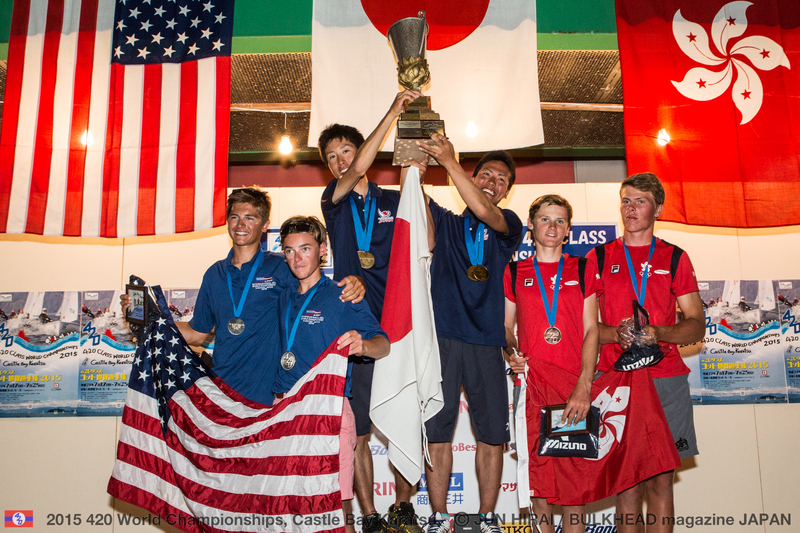 Teams contesting the U17 World Championships raced a single series of 12 races.